Pushing Polaris to new heights. A little back history is in order. It was recently discovered that AMD's reference RX 480 was pulling more wattage from the PCIe slot than the spec allows for, which is 75W. Some sites also found that the overall power draw often exceeded the AMD's 150W claim. To fix this, AMD released an updated Crimson driver that rerouted part of the card's power draw from the PCIe slot the sole 6-pin PCIe connector. That brought the PCIe power draw under spec, but technically overloaded the 6-pin PCIe connector. That shouldn't be a problem, but for anyone concerned, AMD also baked in a "compatibility" toggle to lessen the overall power draw. There's a performance hit from running compatibility mode versus leaving it turned off (the default setting), but thanks to other optimizations and possibly less throttling, AMD says the minimal performance impact is offset. Asus decided to take things a step further and redesign power allocation on is own. 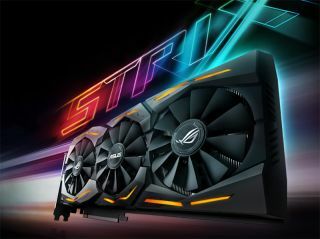 Its ROG Strix 480 uses a custom voltage regulator module (VRM) and specially designed printed circuit board (PCB) to draw "100 percent of the GPU power from the PCIe power connectors (rather than splitting the load between the connector and PCIe slot)." Note the word "connectors," as in plural. Assuming that's not a typo (Asus doesn't indicate the power scheme outright, nor has it released press photos or put up a product page yet), it seems the ROG Strix RX 480 uses two PCIe connectors instead of one. Some may consider that a downgrade in design, though the benefits of an added cable are presumably superior overclocking performance and stability. To that end, the ROG Strix RX 480 sports a 1,310MHz boost clockspeed in gaming mode and 1,330MHz clockspeed in OC mode. Both represent an overclock over AMD's reference 1,266MHz boost clock. If that's not enough, Asus says there's headroom for further tweaking. Asus slapped its DirectCU III cooling solution the ROG Strix RX 480. With three wing-blade fans moving air over the length of the card, Asus claims the card runs 30 percent cooler and and is three times quieter than reference, all while offering up to 15 percent faster performance in 3DMark Fire Strike Extreme and 19 percent faster gaming performance in both Hitman and Doom. The ROG Strix RX 480 will be available sometime around the middle of August. No word yet on price.